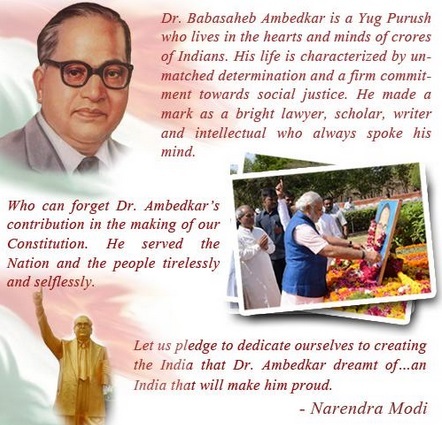 Today is 125th Javanti of Yug-Purush Sri Bhimrao Ramji Ambedkar. The man who gave us the Constitution and been instrumental in breaking orthodoxy as well as bringing reforms in Hindu Dharm. He has been always misunderstood by Upper Castes and down-looked by Intellectuals. His peaceful fight against Upper Caste hegemony is worth knowing and inspirational . He was bribed by Christian missionaries and Muslim Maulvis to convert into their respective religion, but he denied those offers. Instead he chose Buddha Dharm which happens to be a offshoot of Hindu Dharm. If at all he had converted then to Abrahamic religion it would had a great impact on Harijan's and probably sounded a death knell to Hindu Dharma. Having born in "Dora" family, I was an practical observer how Harijan's were mistreated by some of my family members. Even till 90's few relatives of mine never allowed Harijan's to enter their house. Much worse dreadful treatment has been meted out to Harijan's by most of the Upper Caste families . Iam ashamed and beg for forgiveness for being mute spectator to such horrible treatment by our tribe. Mere apologies wont do. Dedicating ourselves towards those downtrodden Harijan's through "Sewa" will help us to wash some of the sins our forefathers committed against them. Do you know Ambedkar was never against Upper Castes , his wife was a Brahmin and his middle name is "Ramji", named after Hindu god Lord Ram. It is right time for us to acknowledge Sri Ambedkar Ji's huge contribution as reformist, freedom fighter and architect of Constitution. I take this opportunity to pay tributes to great son of Bharat Mata .